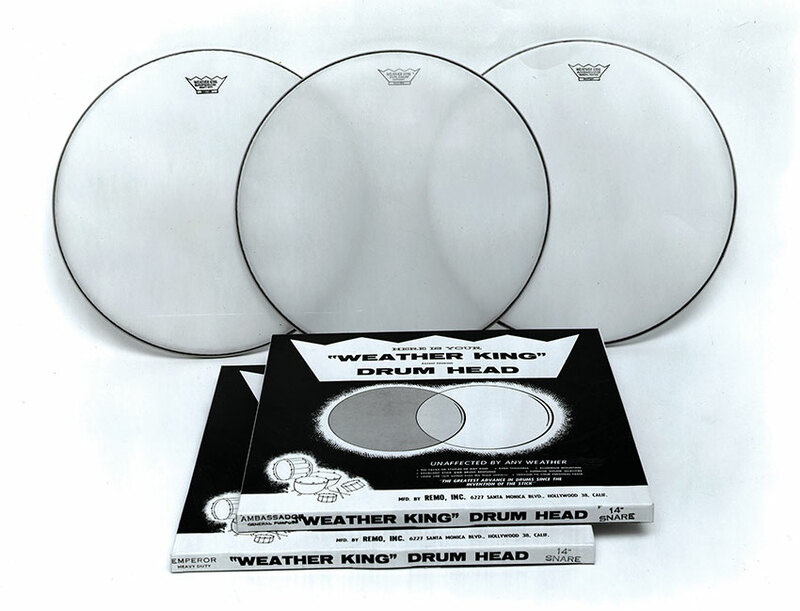 Remo's original Weatherking® drumheads have set the industry standard for over 60 years. Remo was the first to use Mylar®, a polyester film made by DuPont, to create drumheads that were unusually durable, inexpensive, and weather-resistant. The Weatherking® design is unparalleled in achieving the fullest frequency spectrum of pitch, tone and consistency. Their full, rich tones have made classic Weatherking® heads the worldwide leader since their introduction in 1957. In 1957, DuPont® was making a number of predominantly thinner films, and only three thicknesses of Mylar® film were suitable for drumheads: 7.5-mil, 5-mil and 3-mil. 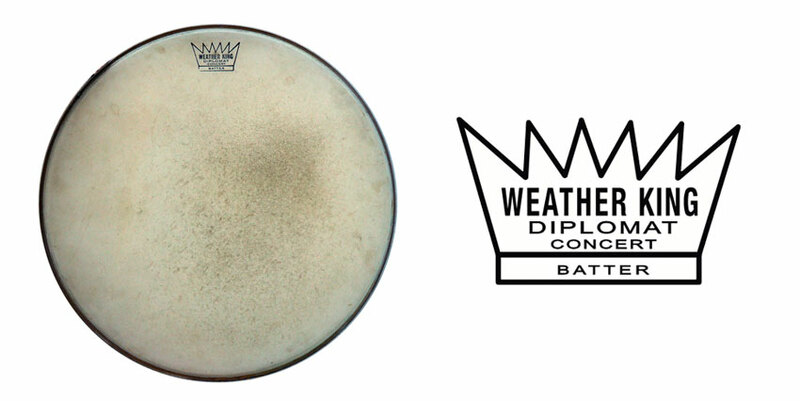 The original Weatherking® drumhead was made from the 7.5-mil thickness, eventually named the Diplomat®. The playing style of the day was much lighter, especially for jazz and concert applications, and this film was able to withstand these playing conditions. The 3-mil thickness became Remo’s Snare Side Ambassador® head. As rock ‘roll music took off and a more durable drumhead was needed, mounting two plies together resulted in the Ambassador®, (7.5 + 3-mil) and the Emperor®, (7.5 + 7.5-mil). By mid-1958, all three of these heads were known by their given name and were in production, filling orders worldwide. Continued developments by DuPont introduced a 10-mil single-ply film, which was adopted as the new film for the Ambassador®. In honor of our 50th anniversary in 2007, Remo re-introduced the original version of the Ambassador, naming it the Ambassador Vintage. Similar developments in film technology led to changes to the Emperor in the early 1980s. When DuPont reintroduced the film used in the original Emperor drumhead in the early 2000s, we launched the Emperor Vintage line. 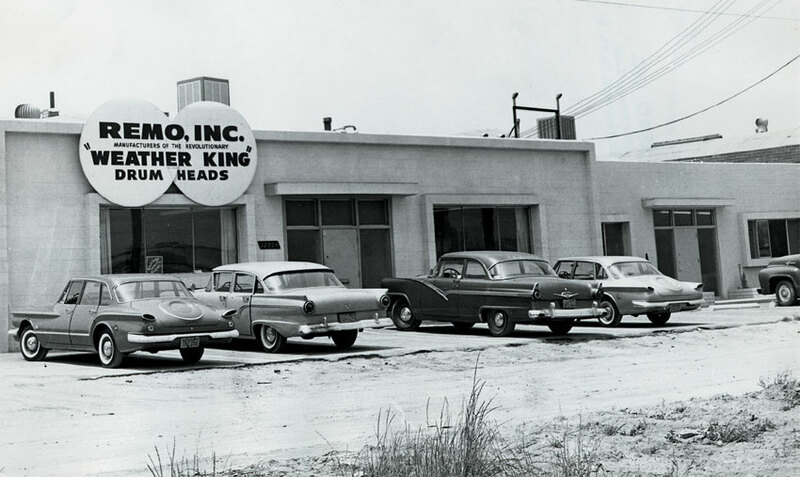 For more than 60 years, Remo has been consistently breaking new ground in the drumhead industry. Ever since we led the industry in the 1960's to standardize drumhead sizes, we've been at the forefront when it comes to crafting, designing and manufacturing drumheads. Because of our technologically advanced R&D on all things drum, we continue to break new ground in developing new technologies to meet the discriminating demands of the world's top drummers. We’re drummers, too, and so we will never stop searching and improving to give drummers the world over as many possibilities to find their own sound. EXPERIENCE THE DIFFERENCE. EXPERIENCE THE KNOW-HOW.